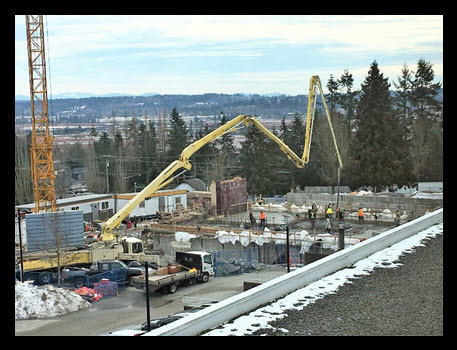 What’s going on at the Surrey Courthouse? 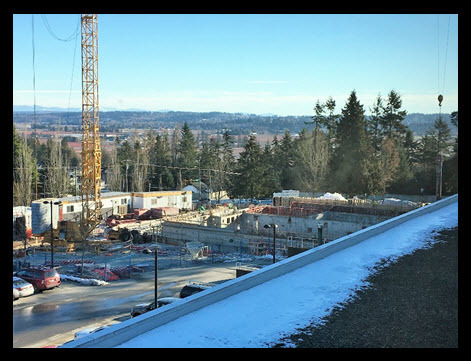 Visitors to the area at Highway 10 and 144th Street in Surrey will have noticed major construction underway beside the courthouse since September 2016, and wondered what’s being built. Well, the project involves renovation of the courthouse built in 1991 and a three-storey addition to it. It’s hoped the project will have several benefits that will increase access to justice for British Columbians living south of the Fraser River. eNews interviewed Provincial Court Regional Administrative Judge Robert Hamilton to find out what’s in store for the courthouse and how the changes underway may improve things. 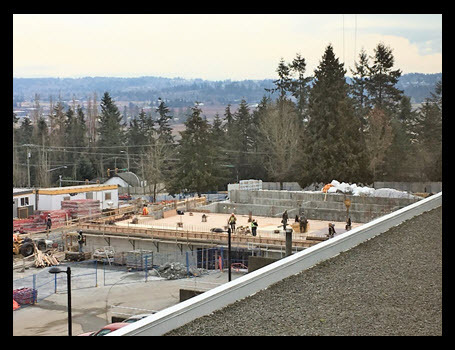 eNews: What’s going on at the Surrey courthouse? RAJ Hamilton: It’s a $33.5 million dollar project that will renovate the existing courthouse and add to it significantly. 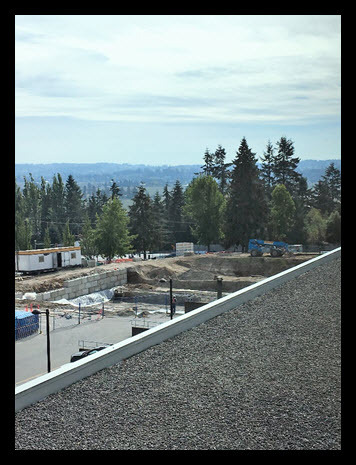 The Surrey courthouse has the largest criminal caseload of any courthouse in BC and the second largest family and civil caseload, making it the busiest courthouse in the province. Court staff have been working in crowded spaces for some time. The renovation will separate the criminal court registry from the family and civil registries – they will be on different floors - and all will be expanded to alleviate the cramped working conditions. New courtrooms, settlement conference rooms and judges’ offices will be added, updated technology and integrated video conferencing installed, and our First Appearance Courtroom will be enlarged. Jail space will be expanded, and there will be a new law library that, like the existing one, will be open to the public at designated times. eNews: Why are the changes needed? RAJ Hamilton: I’m told that when this courthouse opened in 1991 it was built for the future. It had been designed to meet not just current, but anticipated future needs of the growing community south of the Fraser River. During the last twenty-six years the building’s use was maximised. Its caseload expanded through population growth in Surrey and when it was designated the courthouse for cases from White Rock, Delta and Langley in addition to Surrey. As the population of these communities continues to expand, this project is a proactive step to deal with higher volumes of cases in all divisions, and to provide the physical capacity to shorten wait times. Providing additional courtrooms is one of the elements needed to decrease delay in the court system. While we’ve made progress in recent years, at present the wait times for longer trials in Surrey are slightly greater than the Court’s standards, and we hope that the added courtrooms will help us bring wait times down even more. eNews: Do you foresee other benefits? RAJ Hamilton: Our services in family and civil courts will be enhanced. There will be additional offices for Family Justice Counsellors who provide mediation for people with family disputes and prepare reports on issues involving parenting arrangements and children’s views. It was also recently announced that a Family Justice Access Centre will be established in the courthouse. A previous eNews article reported that Family Justice Access Centres offer self-help resource rooms to support people with various family and civil justice needs (such as separation and divorce, housing or debt issues), limited legal advice from lawyers onsite, debt counselling, and civil mediation. Those services would all be of assistance to our many self-represented litigants. We should also be able to provide earlier case conferences where judges meet with the parties in family and civil disputes to discuss settlement, because the number of case conference rooms will be doubled. eNews: Do you anticipate any changes in the criminal courts? RAJ Hamilton: Expansion of the jail cells in the building should reduce crowding there. One of the new courtrooms will be a state of the art high security courtroom, bringing the number of courtrooms with heightened security to two. This will assist us to deal with cases like those linked to armed gang violence while keeping court staff, people involved in court proceedings, and the public safe. RAJ Hamilton: The judges and judiciary staff are looking forward to conclusion of the current construction in 2018. We are all excited to participate in the enhanced services we will be able to offer the public through this renovation and expansion project.